Tu Ake fuse elements, ideas & concepts inspired by traditional Maori art-forms with the fashion trends of today to capture the uniqueness of Aotearoa urban culture. 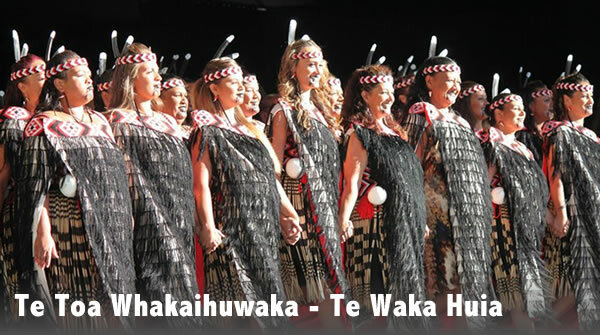 Utilizing fashion trends of today as means to promote our Maori culture, keep our Rangatahi engaged in their culture and provides them with an open gateway to be exposed to the traditional art-forms and culture that inspire Tu Ake. Our belief is that by amalgamating our distinctive design with the current trends of today, we have a greater chance of ensuring that our culture, our heritage and our stories secure a place long into the future of an ever evolving world. they flash aight… be no good in the hangi hole ea! lol premo idea 4shore! he korero i tuku iho mai taku kuia he whakaaro i puta mai i te kitengia o enei tumomo ahuatanga i puta mai i tou ake hua e hoa ma! ehara ko to tu i te wa nei, engari ko to mana i waihotia iho ai koe, kia tika ai to tu maia! it is not the stance u stand in today it is the impressions that you have left behind that make an impact on how u stand strong! You dont want to leave these flash h? outside the wharenui ne? 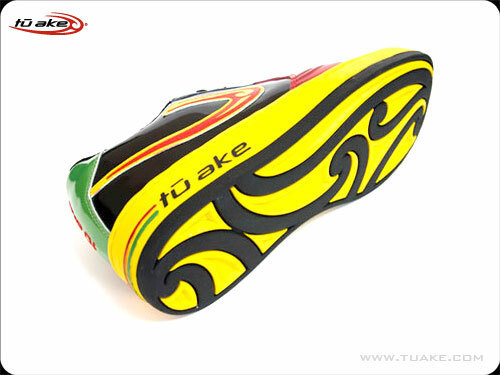 Kia ora te whānau – I was having a think and you know how at the beach as you’re walking you see everyone’s footsteps in the sand, well I began realising that these shoes don’t trample on the koru at all, they simply create them as you walk. 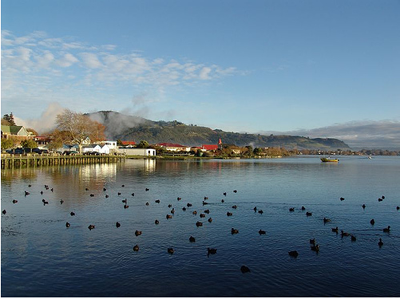 They leave this beautiful impression on our whenua. Yes Kia ora! Yes it’s great to have these kinds of debates because in my years of practice as an artist and designer, I have found that some of our people are ignorant of these matters until the deed has be done to them before becoming educated and educating others of Tikanga Maori & Matauranga Maori issues surround taonga Maori & kaitiakitanga. It’s not just tauiwi that breech Maori values and belief systems. 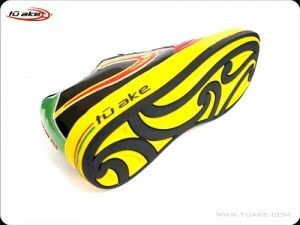 Oh Natalie – kao, these are the work of Tu Ake (check out their site http://www.tuake.co.nz to log your order. Interesting korero, and I understand the inherent tensions that have been raised. From my perspective there is a very clear difference between a corporate body misappropriating cultural designs and Maori artists and designers incorporating koru/kowhawhai into their work. 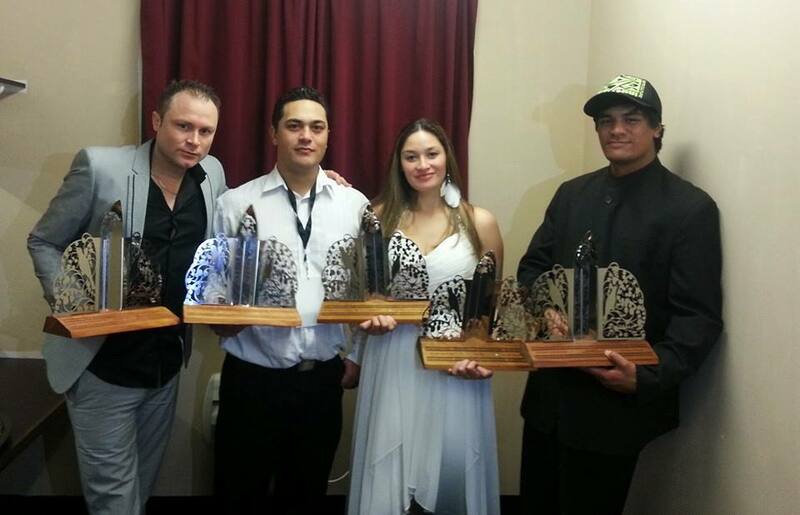 For me, wow, mean, incredible to see rangatahi making a distinct mark, having the tautoko of their kaumatua and whanui as well as to see incredible stylz that reflect rangatahi as vibrant, creative and proudly indigenous. Appropriation is still a hot debate in Visual Arts Design Faculties. I call it Misappropriation. Had real issues around this in my print and computer graphics classes. Managed to resolve the issue personally, completing the brief without takahi on someone elses creativity, referencing the whakapapa links by to the source. Chur cuzzie are you serious? – those are pretty mean! How can I score sum? is it tangatawhenua.com?? Engari, ae, kei te whakaae tahi tāua ki tena take. e hika, arohamai… nā Maui ehara nā Mark. 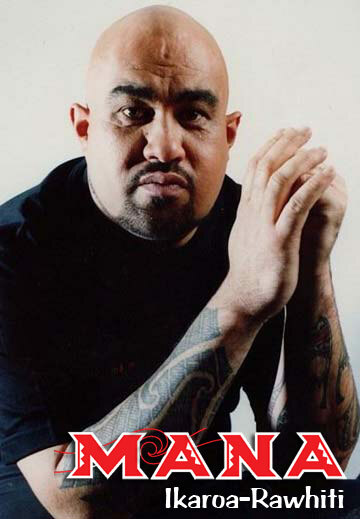 Nā Maui ehara nā Mark, ko te kiko tonu o te wero pea, o te WAI 262 rānei kia kaua e riro te mana o ngā taonga Māori ki a tauiwi. Te aahua nei kei te whakaae tahi tāua ki tena. Ae tika tena, though I don’t think Mark was saying it was just because Air NZ was doing it. He rereke Kai Tahu pea?! 🙂 I just think it highlights some of the problems with deciding what is and isn’t tika in a contemporary context. If it’s not OK to hikoi i runga te koru is it ever – and I wonder how/why did the WAI262 claimants decide that’s it’s not tika to walk on the koru? 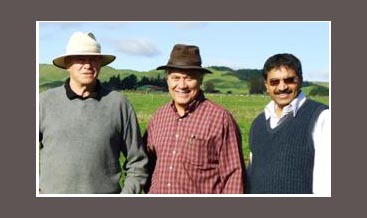 Ka patai au ki a Aroha Mead me Mark. He rereke katoa tenei i taahau i kii ai. Na te ringa maori tonu a Tu Ake. The Air NZ “ownership” of the koru differs from your “irony” comment. A lawyer for WAI 262 Maori intellectual property rights claimants says Air New Zealand has no right to threaten its unions over use of the Koru symbol. Maui Solomon says the company hasn’t got a leg to stand on. “Air New Zealand claiming exclusive rights over the koru is ludicrous. 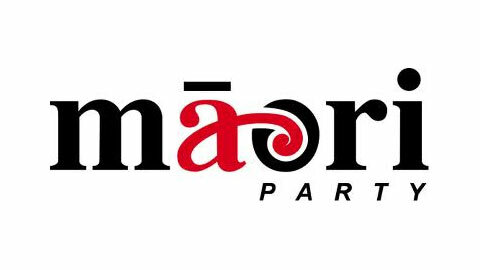 It’s clearly the name and the design are based on traditional Maori imagery, so it’s ironic now that Air New Zealand would be asserting exclusive copyright against their own unions,” Mr Solomon says. He says some years ago WAI 262 claimants forced Air New Zealand to rip up carpets in its lounges because it was not appropriate to walk on the koru. Kua wareware au te mangai o tera korero. I might have the article somewhere still. I was teaching at design school about appropriation with Rangi Kipa and Julie Paama and it was a hot topic amongst the students and staff – that was late-90s. Kei hea te koru e takato ana? Kei te wao nui, mehemea kaore i te tika ki te hikoi ki runga koru, kua kore tātou e taea te haere ki te ngahere. Ironic pehea? Kei te mea mai koe, kaore i te tika ki te hikoi ki runga koru? Kinda ironic when Tangata Whenua jumped up and down about Air NZ putting the koru on their carpet a few years back! There were complaints that it was offensive to walk on the koru as symbol of whakapapa, etc. Air NZ ripped it all up and created a new design. 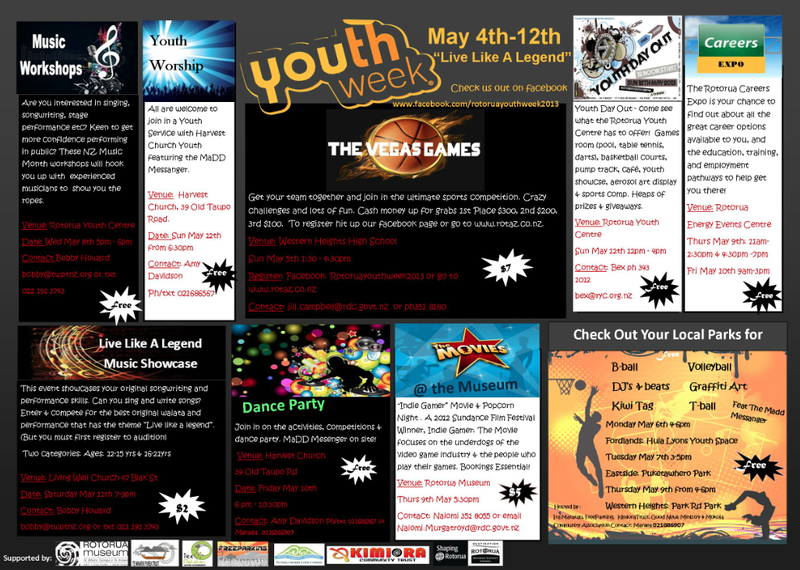 Rotorua Rangatahi – We Need YOU! !